John Warner's song and verse cycle tells of the great flood on the Murrumbidgee in Gundagai in 1852, the struggles of white settlers and the steadfast heroism of Yarri and other indigenous people. The Forties recorded the work late in 2006 - there is more information at John Warner's website. The cast on this occasion will be: John Warner, Robin Connaughton and Don Brian (who all sing and play instruments), Margaret Walters, Jennifer Lees and Tom Hanson (vocals). Christine Wheeler will add additional vocals and instrumentation, and John Derum will be the narrator. The newest presentation by the Roaring Forties is a 90 minute selection of the poems of Cicely Fox Smith (1882-1954) telling of the working lives of sailors with musical settings by various writers including members of the Roaring Forties. A Victorian lady, Cicely published under the name C. Fox Smith and her writing was respected by the redoubtable collector and shanty-singer, Stan Hugill. She was an intimate observer of life on the clipper ships, the shipping ports on the NW Pacific coast as well as the London docks and she captures vividly the vernacular of sailors. 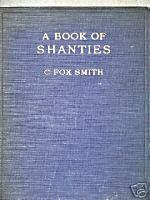 her writing was respected by the redoubtable collector and shanty-singer, Stan Hugill. The Roaring Forties will be back in acappella mode and joined by their long-distance member, Brian Grayson. They look forward to sharing their fascination with the remarkable Cicely Fox Smith. There'll be chorus sheets - participation welcomed. CDs of the Roaring Forties and individual members will be available. Look for the Feathers and Wedge flyer in the shop for details. Loosely Woven goes 'On the road' again! Folk events in the Australian Captial Territory.